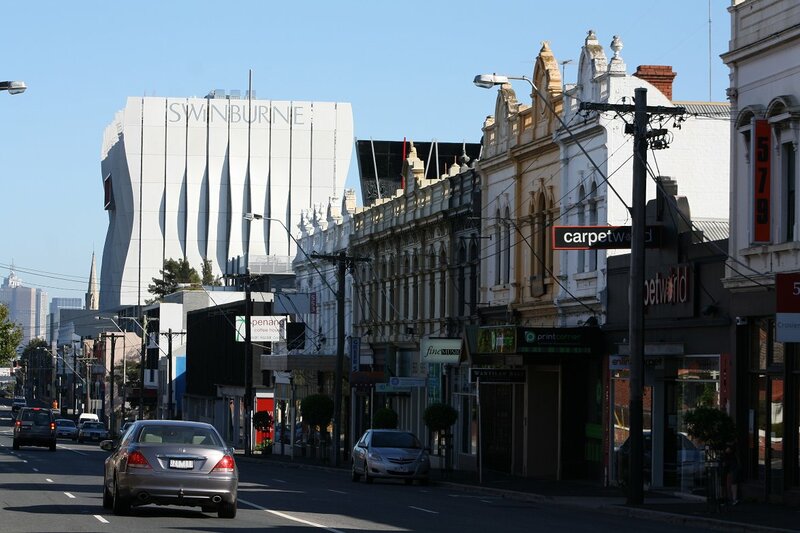 One of Hawthorn's most prominent buildings is nearing the construction finish line, with final touches now being applied to Swinburne University's Advanced Manufacturing and Design Centre (AMDC). 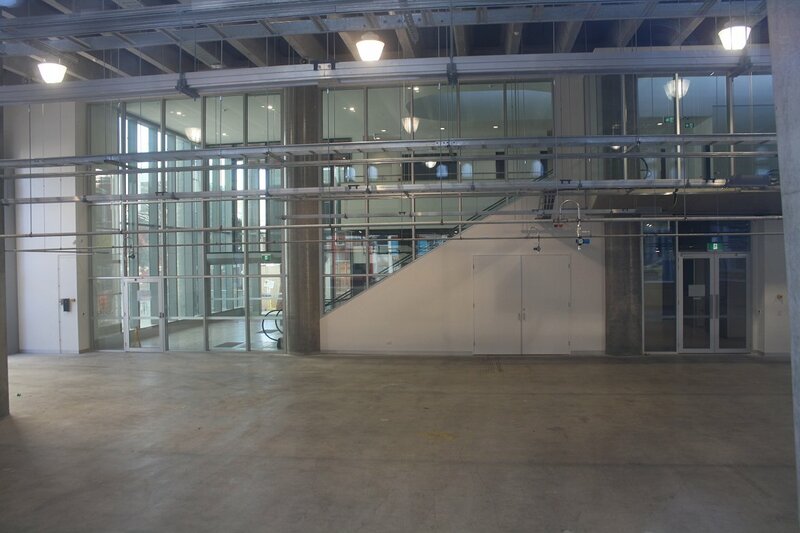 This past Monday heralded the opening of the lower six levels, allowing staff and students an initial look within the learning facility, an image of which is provided below via Swinburne's Facebook page. 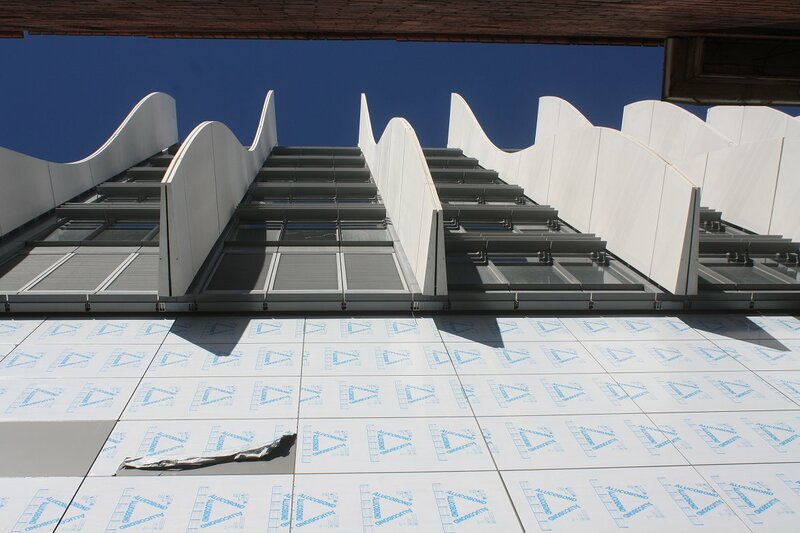 Site demolition commenced during September 2011 and although the subsequent ground works, build and fitout have taken some time, the end result is a visually challenging and architecturally unique building defined by its facade frills. 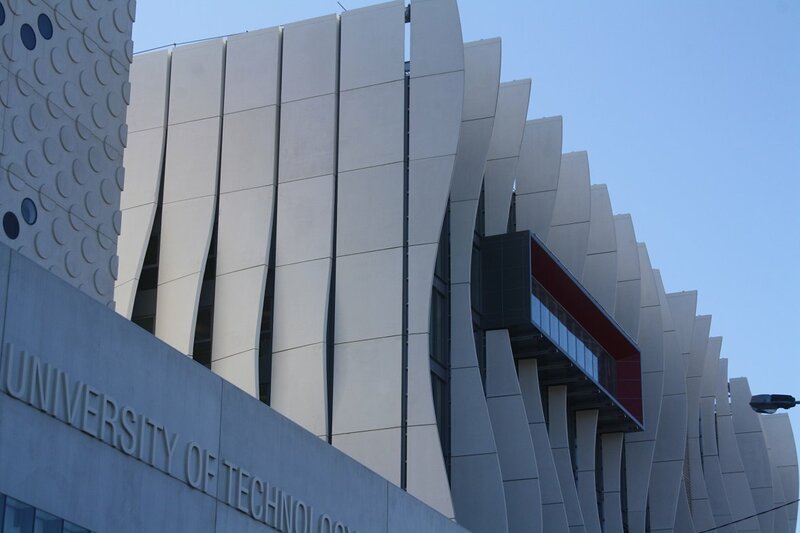 With Sinclair Knight Merz (now Jacobs SKM) the driving consultancy behind the project, Swinburne AMDC is set to become "A hub of excellence in manufacturing and design innovation and collaborative learning." 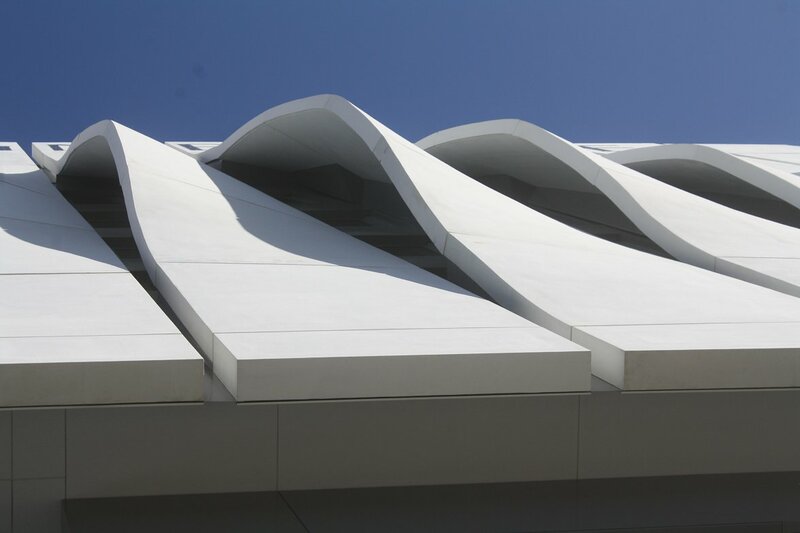 Externally the facility features heavy use of shaped vertical precast panels which are intended to resemble engine turbine blades. 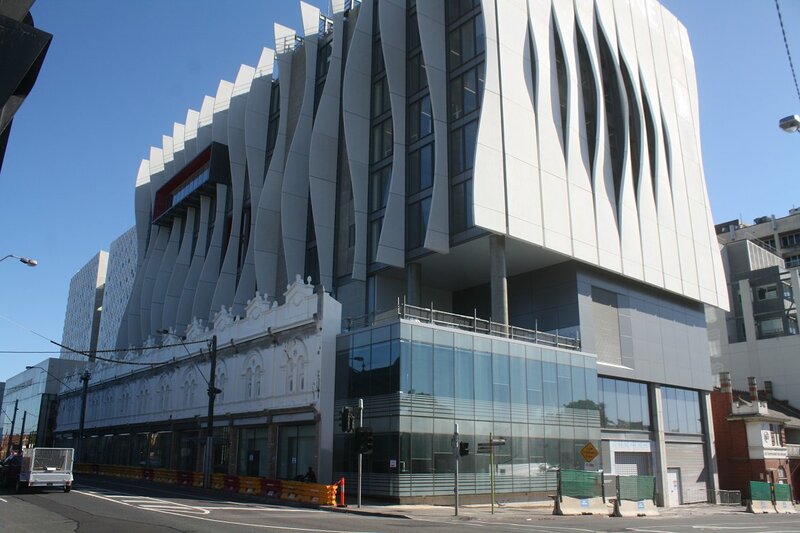 Intended to portray Swinburne's reputation as a leading design and research institute, the frilled facade also provides extensive sun shading while also adding a modern three-dimensional context to historic Burwood Road. 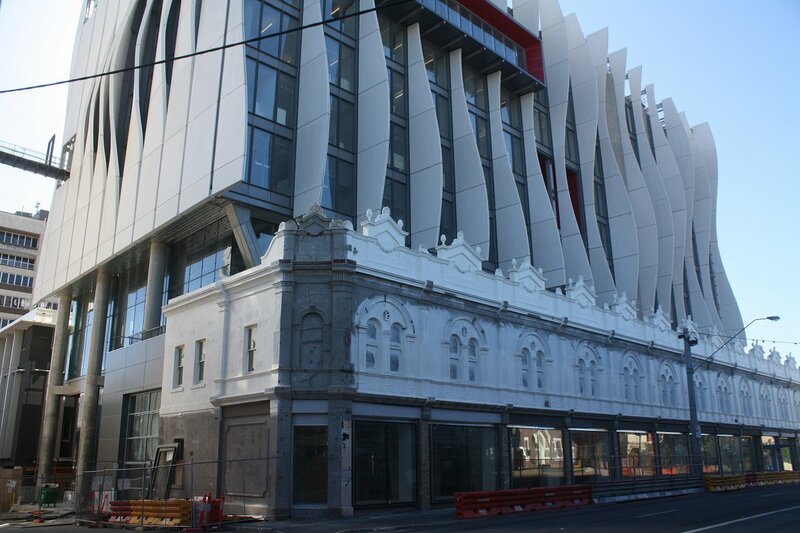 The Victorian-era facade along the Burwood Road frontage has been maintained and incorporated, with the new building set back and designed to 'float' above the heritage feature. 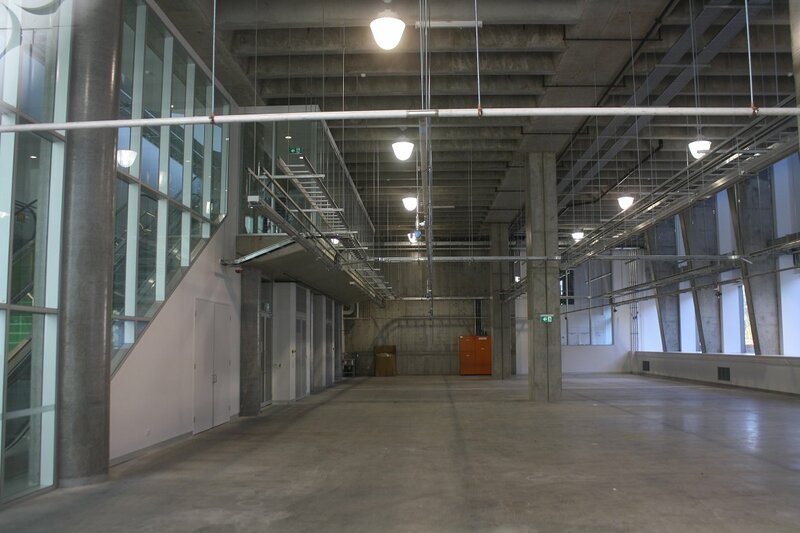 Internally the building consists of two basement levels, dual "Factory of the Future" spaces fronting Burwood Road (see slideshow below) and a sky lobby. 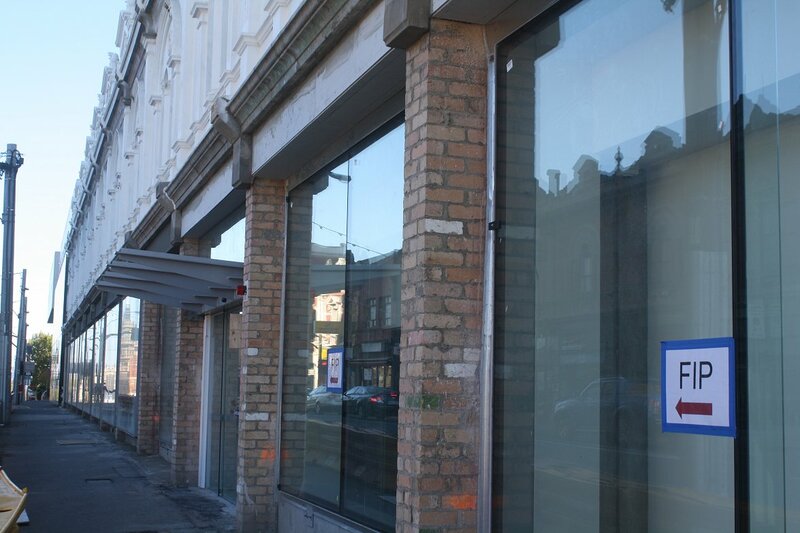 Atop the Victorian facade the setback allows for a roof garden according to plans. Also included are lecture theatres, teaching classrooms and workshop space, office accommodation, display areas and student/staff break areas. 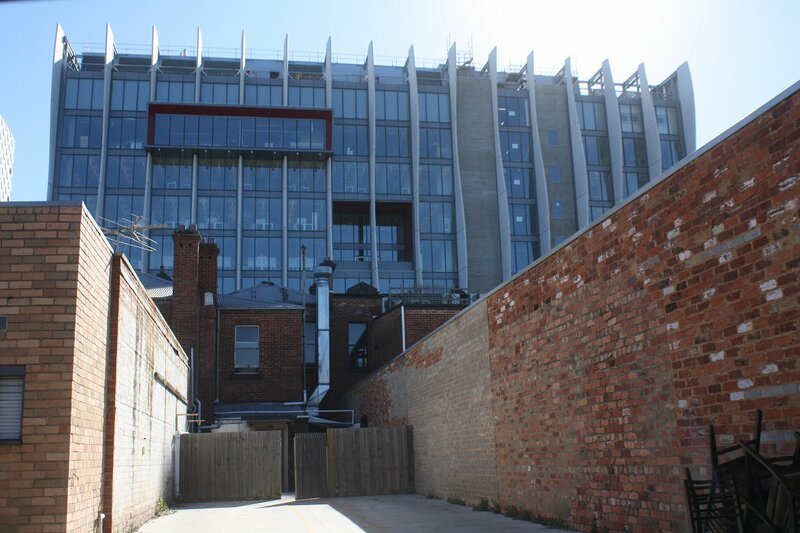 One of Swinburne University's main goals was for a facility that minimised resource consumption over its life. To meet this goal the SKM services and ESD teams implemented environmentally sustainable design solutions on the facility which is being certified to 5 star Green Star. This includes the use of exposed thermal mass and radiant cooling, combined with under floor air distribution systems, utilising 100 per cent fresh air ventilation through the principle of displacement ventilation, providing a healthy and comfortable internal environment. The design of the atriums contributes to the maximisation of daylight in the building, and doubles as a chimney which utilises principles of thermal stratification to exhaust stale, warm air during summer and collect it in winter to pre-heat incoming air. Other features of the design include LED lighting, greywater recycling, rainwater harvesting, extensive external shading structures, and spectrally-selective glass which allows daylight penetration whilst inhibiting direct solar heat gains. NSW-based manufacturer of renewable and low carbon energy equipment, Simons Green Energy, were contracted to install a 230kWe natural gas fired trigeneration plant. A 230kW Ener-G Cogeneration Plant and a 250kW absorption chiller allows the simultaneous delivery of three forms of energy – electricity, heating and cooling via the use of natural gas. According to reports the system carries a total efficiency of 85 percent compared to the 25-30 percent efficiency of grid-supplied electricity. 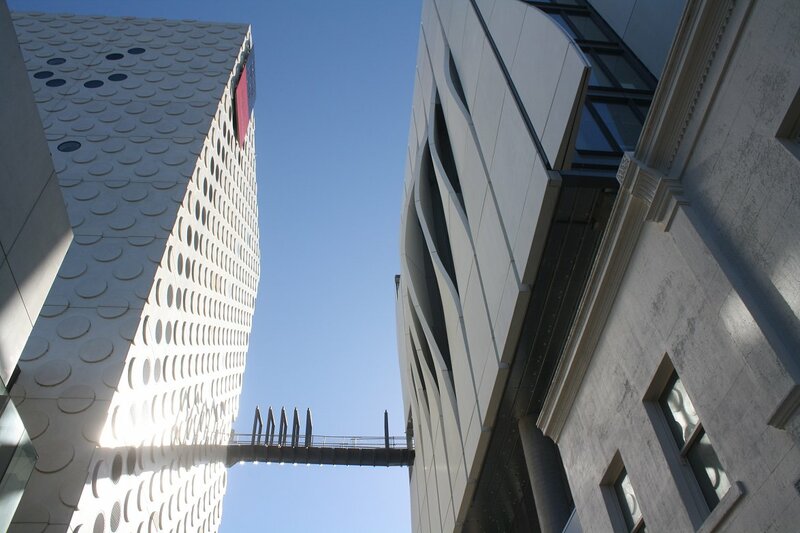 From the adjacent AMDC is a cracking building that brings a unique element to the Burwood Road realm. As good as it is from certain angles, it doesn't necessarily impress from others. 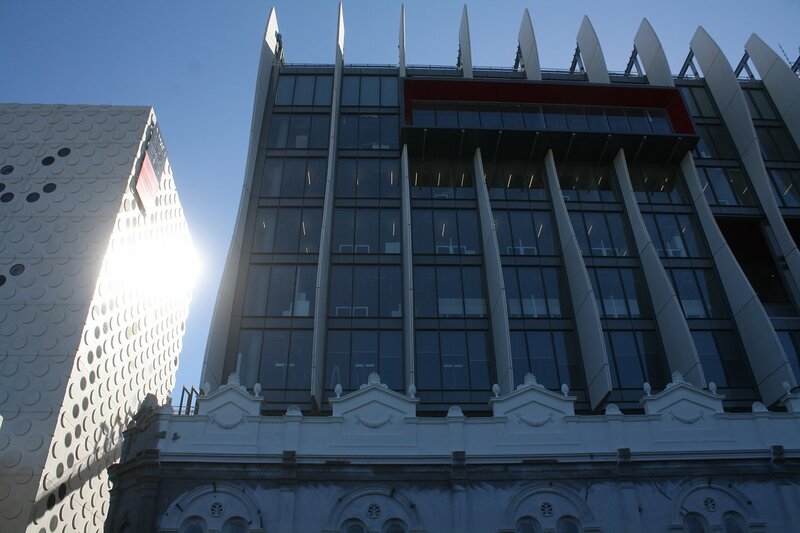 Exposed core and rooftop plant coupled with dare I say cheap looking facade panels leaves the viewer less than overwhelmed when viewing from the south. 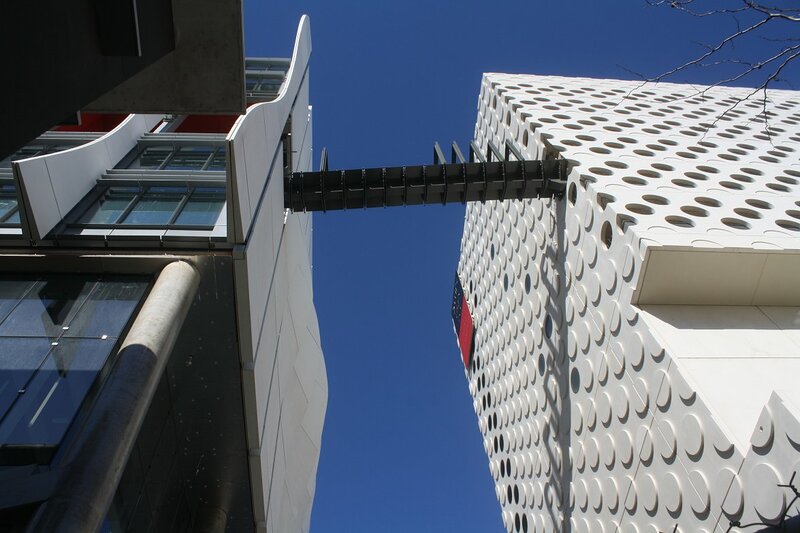 Nonetheless AMDC along with its slightly older Swinburne ATC to the west do complement one another nicely and provide the design statement that Swinburne University sought. Further reading: SKM Swinburne AMDC page. Enjoy the image set below taken in recent days.